I faced down the sourest drink in the land and came out plum puckered. Maybe you read my review of the Taco Bell Cherry Limeade Sparkler and wondered out loud to yourself “Hmmmm . . . Seems odd that he would go right for the Cherry and skip the Classic Limeade Sparkler.” And, I would tend to agree – except – that there was something extra dubious about the Classic – with it’s neon green glow. The way that it sat there with it’s unwavering gaze on the poster – staring – beckoning – I was honestly not sure what it was offering – and – I was even more unsure if I would be able to handle it – regardless of what it was. The whole situation made me so unsure – that I have been driven to write even more run-on sentences than I ever imagined possible – and – believe me – I can imagine a world overrun by run-ons . . . like kudzu in the deep south – taking over everything – engulfing – obliterating. Sorry – my Grandmother’s house (where I mostly grew up) has been long abandoned and eaten by a wave kudzu . . . It is a sad site. So – you see – this Classic Limeade was all up in my grill . . . playing mind games with me. It’s aggressive stance and it’s boardwalk dance were more than I was ready to deal with. I went for the Cherry – and I still contend that it was one of the best drinks that I have ever had – even the one that I had where the drink machine was in the restaurant – and the girl behind the counter put 4 squirts of red into a cup and said “Add ice and Sierra Mist.” I stared at her dumbfoundedly – this was a premium drink (in price and quality) and I was being made to make it? I was being given the keys to the kingdom? Well, I took those reigns and rode that horse to happy drink land . . . Which was great until she called me back over and said “Here.” and dropped a wedge of lemon in my cup. LEMON?! No – no – no. It was supposed to be lime – the photo has a lime – the commercial has a lime – the world isn’t quite right if it isn’t a lime. The drink – however – was still a treat. It persevered. 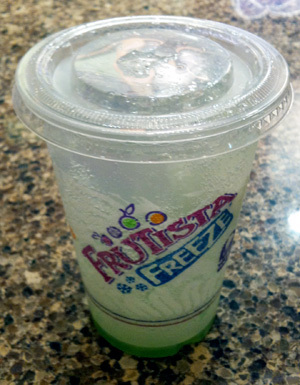 I eventually got up the guff – raised the cackles on the back of my neck – and got a Classic Limeade Sparkler. The entire time, I was looking at the poster of the Cherry. I was Mister Natty Nervous. The drink came out – with the proper lime wedge – and I took a sip. Bling-o, Blamm-o, Bloom-o – it was one of the sourest drinks that I’ve ever had. It has to be the drink that Sourpatch Kids drink in place of Gatorade . . . they probably even dump coolers of it on their Sourpatch coaches heads at the end of Sourpatch sporting events. My brain couldn’t figure out what in the world was going on – I tried to shake the cup to mix the sour green in with the Sierra Mist – but it was too full. I then got smart and moved my straw out of the danger zone and lowered the level of the beverage . . . it was not going to beat me . . . no way. I drank and I shook and I drank and I shook. Eventually, it got to the point where the Sierra Mist was so overpowered that the shaking stopped doing any good – and so, I just drank. I started looking like a dog who had just been given tart raspberry jam – just smacking my lips and tongue to try to maintain all senses of feeling in my mouth. I could have had the Cherry – I could have had the Cherry . . . but – for you guys – I went Classic all the way – and boy did Classic make me pay. On their website, Taco Bell goes a long way towards running it home that the use REAL limes and REAL lime juice . . . even going so far as to capitalize on the “REAL” twice – because that makes everything all that much more REAL . . . Well – my review of this drink is about to get as REAL as I can possibly get. Unless you are a prickly pear, a sourpuss, a cat with a lisp or a face in need of a serious pucker job – then I highly recommend scooting just a little bit over on the Taco Bell menu and ordering the Cherry Limeade Sparkler – because the Classic? It’ll hurt you. One crazy thing that I need to bring up – after having a few of these Sparklers – is that Taco Bell insists on using the straws that are designed for a drink with an ICEE consistency. 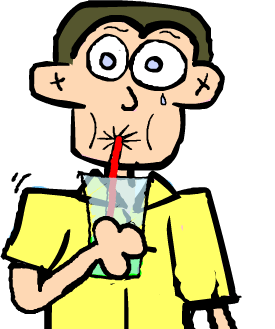 The straw has that little flipper of a spoon on the end – which means that you are automatically missing out on the last inch – or so – of your drink . . . and this makes no sense whatsoever. I have started saying “No thank you” to their offering of their malformed straw and moving over to grab a real straw for myself . . . I suggest that you maybe should do the same for yourselves. Take charge of your drinks. Straw revolution! A quick side-note, after writing the bulk of this review – and getting depressed – I went to my Grandmother’s old house with several large Classic Limeade Sparklers in tow – I put them into a garden sprayer and sprayed down all of the kudzu that had overtaken the house. I am happy to say that the kudzu pulled back with amazing speed – almost looking puckered. I now know the ultimate proper use for this drink – fighting the scourge of kudzu . . .
We’ll take that point for the team. 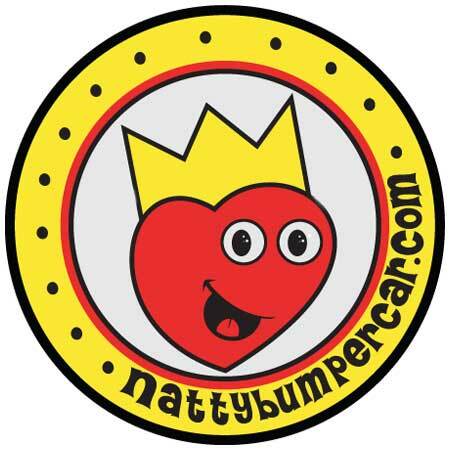 Bumperpodcast #135 – Yay, Robot! Bumperpodcast #219 - Mystery of the lost episode. Bumperpodcast 76 – Bye-bye Bamboo! OMG! 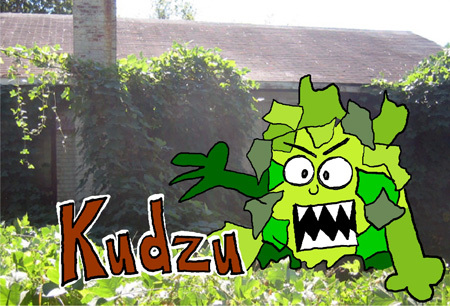 Kudzu is the scourge of the earth!! LOL>…. It is creeping up on you right . . . NOW! !